Tungsten Analysis: WC Preview Part 1 - A world champion! A world master! And then we've got the seeds! WC Preview Part 1 - A world champion! A world master! And then we've got the seeds! 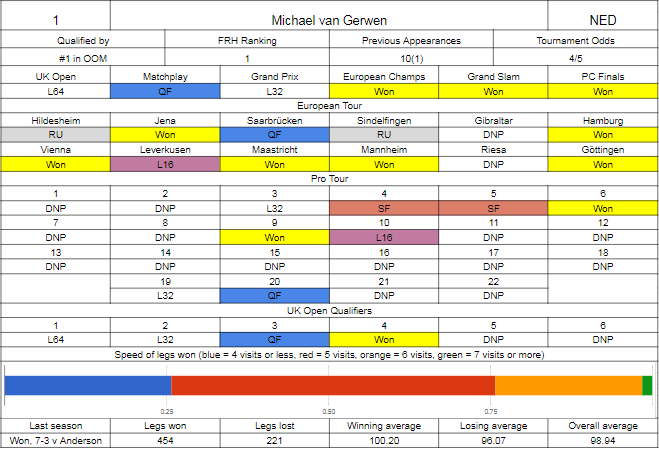 - how they've qualified, the current FRH ranking (at the time I pulled them, which was about a week ago, since then there may have been minor changes, particularly among lower ranked players who have probably risen a few spots), their previous appearances (the bracketed number indicates Lakeside appearances) and the best available odds at the time I looked. You'll then have a bunch of results - DNP encompasses a bunch of things, either they didn't enter, didn't qualify, or didn't cash. The coloured bar indicates speed of winning legs as a 100% stacked bar chart - more blue/red = good, more orange/green = not so good. This data comes from all ranked stage standard 501 games this season, from Lakeside onwards. BDO stats are used where available, which includes Lakeside and the World Trophy, PDC is everything after the last worlds. We then have what they did in the worlds last year, the number of legs won/lost in my database and some per turn (note - not per dart multiplied by 3) averages. If it's a qualifier and says DIV/0! then it's because there's no data and I've been lazy and not incorporated error checking. The writeups will have the best odds available at the time of writing for the match in question, and then a projection of how often a player should hold a set on throw. I've tried to ensure the information listed is accurate, but make no guarantees - if you're using this for anything serious please check somewhere else to be safe! Our opening game for analysis features two players each of whom have had a season of two halves. Michael van Gerwen, who came into this season as world champion, had a pretty slow start - after qualifying for the UK Open really comfortably, then had to withdraw due to injury, missed a bunch of time for the birth of his kid, was quite ordinary at the Matchplay and got soundly beaten by Phil Taylor, then was on the receiving end of a round one upset in Dublin to John Henderson, which nobody saw coming or thought could happen, not even in the Henderson household. Since then however, he's been more or less untouchable. Winning the last three ranking majors without being seriously troubled at any point outside of Kyle Anderson playing out of his skin in the European Championship semi final and Rob Cross hanging around for a while. 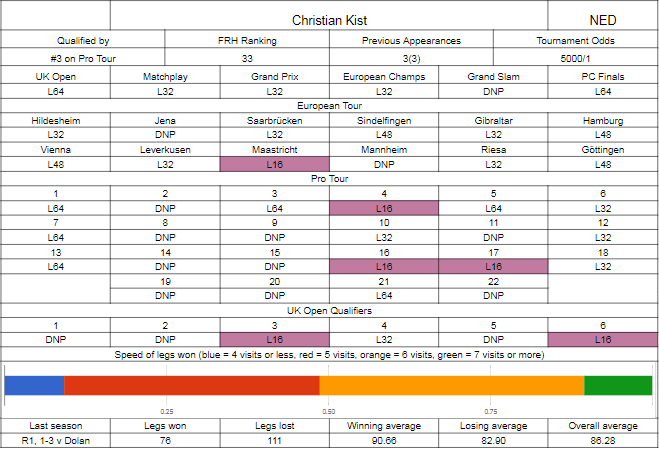 He's not played much of the Pro Tour for reasons mentioned above, but has been consistent in Europe, claiming half the titles available for an incredibly impressive season on that circuit. Add in being gifted the Premier League, claiming the World Series of Darts and the Masters, it's been another successful season for Michael, but one where he'll probably think he could have done better. Kist on the other hand has gone the other way around. Doing well enough on the UK Open qualifier circuit to make the money automatically before losing to Dirk van Duijvenbode, he's rounded up enough money from the various circuits to finally start to get the PDC, making the Matchplay and looking very good in a tight defeat to Gary Anderson in the opening round, possibly the best he's played since moving to the PDC, and also the Grand Prix, where he missed a match dart against eventual finalist Simon Whitlock. Since then however he's had issues with gout, making him for all intents and purposes unable to play - averaging in the sixties against Dekker in the European Championship, a real shame given his impressive performance in that tour, qualifying for ten out of twelve events, and he wasn't much better in the Players Championship Finals, at least managing to win some legs but still finishing under eighty against Simon Whitlock. It seems that every Dutch player has some sort of injury that crops up every year, for Kist it's come at the business end of the season. Those holding set percentages are based on legs won. Kist has not won many legs since his injury, so that stat is relatively unaffected. As the figures reckon he's around 20/1 shot to be able to hold both of the sets he would have thrown in the first four without injury, it goes without saying that he's drawing more or less dead. Our other match in the first section is one that's a lot more intriguing to analyse. 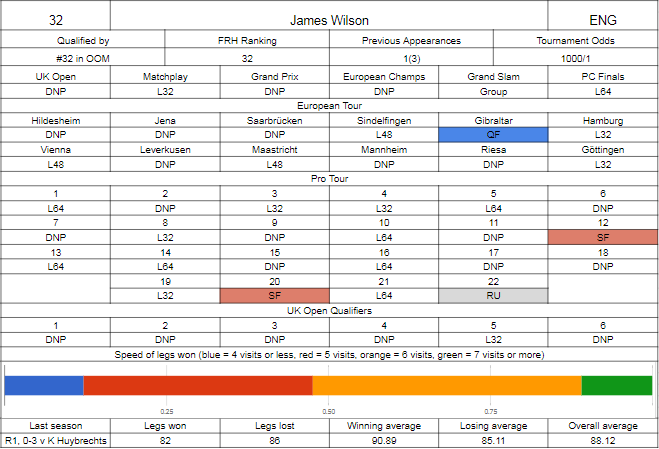 Wilson's just managed to climb into the top 32 at the end of this season, to improve from the previous year where he was the #1 ranked non-seed in the Pro Tour rankings, landing him in a game against Kim Huybrechts where he had little chance. This year he's consolidated well, having a slow start where he only just made the UK Open and, after beating a pub qualifier, lost a decider to Vincent van der Voort to not make the money. On the floor he's done OK in the latter stages of the season, making the last final only to lose out to Jonny Clayton, and getting to another couple of semi finals, as well as making the final session of Gibraltar, getting wins over Kim Huybrechts and Ian White before falling to Daryl Gurney. He made the Matchplay and hung around well with Peter Wright before trailing off to lose 10-8, but didn't make either of the next two, couldn't escape a fairly solid Grand Slam group having won the wildcard qualifier, and then lost a decider to Willie O'Connor in the first round of the Players Championship. The newly titled Lethal Biscuit, if Twitter is to be believed, will be looking for a win here in what is effectively a final, to solidify a top 32 berth. Ratajski has had quite the season. Only just losing against fellow eastern euro Darius Labanauskas at Lakeside, he opted to play the European Tour. His qualifiers are tough, with only one advancing, but he managed to win it 11 out of 12 times for one of the best attendance records on the European Tour. He's not managed to do a huge amount outside of a great run in Maastricht, where he thrashed Steve Lennon before overcoming two home favourites in Jelle Klaasen and Christian Kist before losing to Peter Wright, but has managed to accumulate a lot of stage experience, which he put to great use in the World Masters. The BDO, in their infinite wisdom, only barred players who have played the main PDC Pro Tour - those who have only played the Challenge and European Tours were eligible, i.e. Ratajski. So he entered and won it, beating Richard Veenstra, Alan Soutar, Glen Durrant, Cameron Menzies and Mark McGeeney - a very good run, which is not reflected in these stats as the BDO won't allow anyone in the UK to watch replays of it to get the relevant information. Oh well. The figures all look quite close, the eyetests saying that Ratajski is a little bit more solid while Wilson has a bit more explosiveness to fire in the twelve darter if needed. 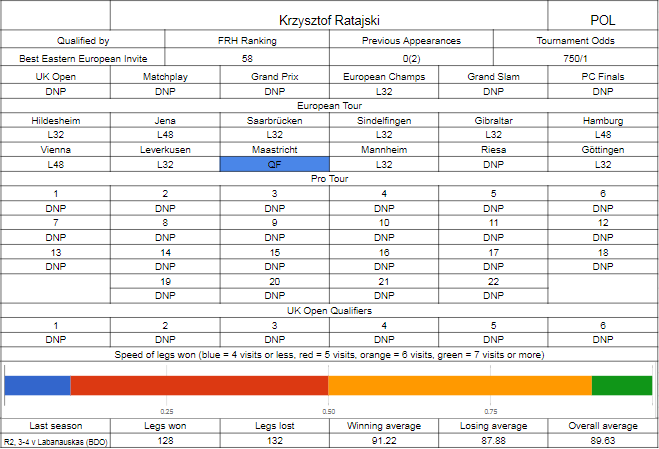 It's hard to say how much the stats will differ if we had World Masters data, but I'm guessing it wouldn't be by that much to really influence things and make Ratajski a solid favourite. The bookies have it evens, and it's hard to look past a fifth set in this one on opening night.